One of Cornwall’s oldest inns, The Sloop Inn first opened doors in 1312. The anachronistic ambiance is harmoniously coupled with the decent selection of keg and cask ales on tap. Lining the St Ives harbour, the Sloop Inn’s outdoor picnic tables are optimally positioned to soak up the Cornish sun. Staying true to its roots, The Sloop Inn serves simple pub grub in its bar and upstairs restaurant, The Captain’s Table. Despite the yesteryear atmosphere, you will find free WiFi! The Old Success began life as a 17th-century thatched alehouse where local fishermen would share the profits from their catch. It’s had a lick of paint (or two) since then, and remains one of the UK's most south-westerly watering holes. Nautical memorabilia and sepia prints adorn the walls, and a roaring fire complements the warm atmosphere. The pub is a St Austell Brewery member, serving quality Cornish ales such as Trelawney and Tribute on tap, perfectly complemented by simple pub grub. The pub’s location on Sennen Cove only adds to its maritime whimsy. Gracefully lining Fowey’s high street, the Lugger Inn serves fresh mussels, scallops, and fish in generous portions! The Lugger Inn has an unmistakably rustic and traditional feel, and its St. Austell Ales scream Cornish authenticity. Check out the specials board for local grub and seasonal delights as you settle in with the quirky fifties soundtrack. As well as high-quality food, you’ll find a vast selection of real ales and sweet Cornish ciders on offer. Dogs and children are welcome too! A member of the St Austell Brewery family, The Harbour Inn is somewhat of a hidden gem, tucked away in the winding streets of Padstow. The inside is spacious and yet cosy, with its recent refurbishment staying true to the Inn’s nautical roots. You’ll find timber rafters adorned with charming naval paraphernalia, as well as welcoming log fires and sofas to snuggle up to. There is decent pub food and an array of specials being served, and children and dogs are welcome. Be sure to check out the homemade Cornish Cream Tea! With a stunning view over the beach and the mouth of the River Fal, The Rising Sun welcomes you with its charming aesthetics and seaside pastel colours. Enthusiastically welcoming dogs and children into the mix, The Rising Sun is open from breakfast right through to the late evening. The authentic Cornish meals are local and seasonal with a traditional pub-grub edge – scallops, scampi, sausage and mash, or local catch with homemade chips. Visiting on a winter’s day? The Rising Sun has a warm conservatory with a stunning seaside view. This revamped seaside hotel in Mousehole has an unmistakably relaxed atmosphere. With Newlyn’s fishing fleet moored just two miles away, fresh seafood dominates the menu. A fantastic wine list also gives this establishment an edge, while a stop-in for a quick coffee may be the perfect way to recharge your batteries. The tropical gardens surrounding the Old Coastguard give it a Riviera-esque feel, while the children’s toys and sleepy hounds reinforce the aura of a ye olde Cornish pub. The Gurnard’s Head exemplifies a hidden gem. Situated off the beaten path in a tiny hamlet amongst rural countryside between Land’s End and St Ives… it’s not the easiest find. Friendly locals neck pints of Cornish ale in the bar, where fine art hangs beneath the rafters, eliciting the feeling of a well-to-do country home. There’s also the eccentric red and blue dining room, which is apt for more formal diners. The overarching menu is a succulent selection of local fresh Cornish seafood and farm produce. Ben Tunnicliffe (whose previous restaurant, The Abbey, has achieved Michelin-star status five years running), bought the Tolcarne Inn in 2012. He aims to maintain the old-timey Cornish pub ambiance while bringing delicious and affordable seafood to its creaky tables. Newlyn’s fishermen dictate the menu, which changes as the catches and seasons differ. This is the perfect place to stop in on the coast path between Penzance and Mousehole, with real ales and a log fire comforting the most tired of walkers. There’s even live jazz on Sundays! Five Degrees West is a brilliant middle-of-the-road pub to enjoy some inexpensive pub grub, wines, and ales. Sitting just opposite Events Square and the Pendennis Marina, you’ll find delicious baguettes and burgers gracing the menu. Sofas welcome you in on chilly evenings, while outdoor tables allow you to soak up the rays on sunny days. Downstairs, “5 Degrees Below” is an intimate party venue that injects some liveliness into Falmouth with live music and drinks! The Halsetown Inn’s regal ivy-draped façade should not deter travellers on a budget! Here you’ll find an inexpensive menu that is beautifully cooked and ethically sourced. From cider-baked ham to twice-cooked free range pork with a smoked mackerel croquette, the Halsetown Inn gives pub grub a contemporary reimagining. 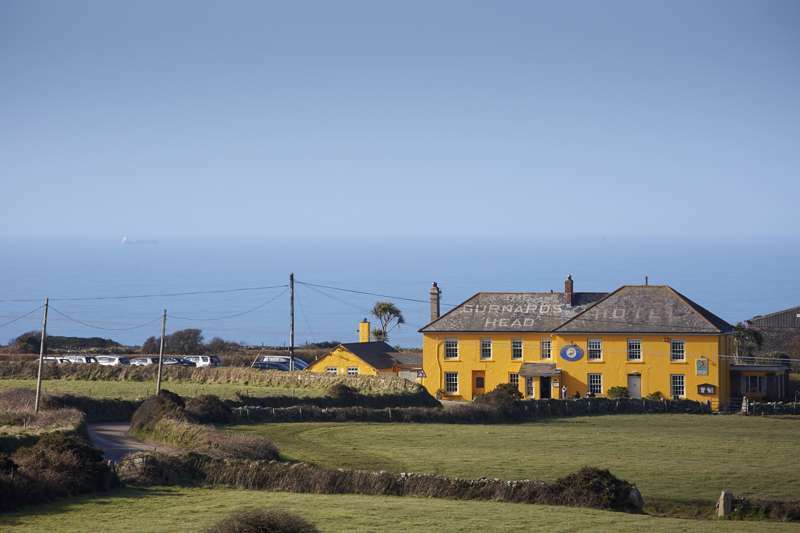 Situated near the coast path between Zennor and St Ives, there’s plenty here to excite the taste buds of exhausted hikers. Be sure to try the cream teas and real ales!